The Brisbane Broncos will play Cronulla Sharks in the 2019 NRL Premiership at Suncorp Stadium on Saturday 27 April 2019. The Brisbane Broncos will play Sydney Roosters in the 2019 NRL Premiership at Suncorp Stadium on Friday 17 May 2019. The Queensland Reds will play the NSW Waratahs at Suncorp Stadium on Saturday 18 May 2019. The Queensland Reds will play the Jaguares at Suncorp Stadium on Saturday 1 June 2019. The Queensland Maroons will take on the New South Wales Blues in the Holden State of Orgin Game 1 at Suncorp Stadium on Wednesday 5 June 2019. The Queensland Reds will play the Auckland Blues at Suncorp Stadium on Friday 7 June 2019. The Brisbane Broncos will play Gold Coast Titans in the 2019 NRL Premiership at Suncorp Stadium on Sunday 9 June 2019. The Brisbane Broncos will play New Zealand Warriors in the 2019 NRL Premiership at Suncorp Stadium on Saturday 13 July 2019. Preliminary kick off: 3:15pm - NRL Touch Premiership Broncos v Warriors. The Brisbane Broncos will play Canterbury Bulldogs in the 2019 NRL Premiership at Suncorp Stadium on Thursday 18 July 2019. The Qantas Wallabies will play the Argentina at Suncorp Stadium on Saturday 27 July 2019. The Brisbane Broncos will play Melbourne Storm in the 2019 NRL Premiership at Suncorp Stadium on Friday 2 August 2019. Main Game: Kick off 7:55pm. The Brisbane Broncos will play Penrith Panthers in the 2019 NRL Premiership at Suncorp Stadium on Sunday 16 August 2019. 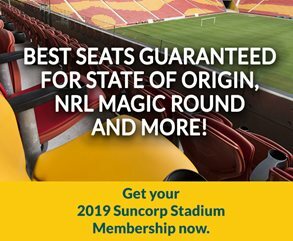 The Brisbane Broncos will play South Sydney Rabbitohs in the 2019 NRL Permiership at Suncorp Stadium on Friday 23 August 2019. The Brisbane Broncos will play Parramatta Eels in the 2019 NRL at Suncorp Stadium on Friday 30 August 2019.